Britain's opposition Labour Party leader Jeremy Corbyn speaks at an anti-racism rally in London, Britain, July 2, 2016. “Are we are facing make-up or break-up?” Labour Party lawmaker Mike Gapes considers the question as colleagues scurry around the parliamentary tearoom scheming and hatching plots to unseat party leader Jeremy Corbyn. The son of a London postman who made good, gaining a place at Cambridge University before rising through Labour ranks to become a member of parliament (MP) in 1992, the near-sighted, rotund Gapes, an expert in foreign policy, isn’t alone among the party’s lawmakers in fearing that Labour is facing its biggest challenge since Ramsay MacDonald split and nearly killed the party in 1931, forming a national government with Conservatives. “Labour doesn’t have a God-given right to exist,” Gapes says. In the wake of the Brexit referendum, which has turned British politics upside down, most international attention has focused on the turmoil in the ranks of Britain’s ruling Conservatives and their soap opera-style, treacherous leadership contest to replace Prime Minster David Cameron. But the country’s main opposition party, Labour, is also tearing itself to shreds as friend turns on friend amid claims of bullying and even of death threats. Much of this is being played out in the genteel surroundings of parliament – a kind of political Agatha Christie mystery. At least one Labour lawmaker has had to appeal to the police to protect her constituency office. Corbyn aides have rebuffed efforts by his deputy Tom Watson to get a one-to-one meeting with Corbyn on grounds that Watson will finger-jab and be aggressive. Most of the party’s "shadow Cabinet" has quit. They argue Corbyn is ill equipped to be party leader and must share the blame for the Brexit referendum result. 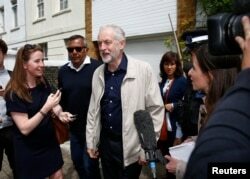 They want Corbyn, who appears to have the backing of far-left grassroots activists, to resign. Even stalwarts fear the death of a storied party, which emerged early-last century from the smoke-filled industrial heartlands of the North and the Midlands and from the Presbyterian chapels of Scotland and the mines of Wales. “We are imploring Corbyn to go in the interests of the party and the country. But there are people around him, some who were members of far-left Trotskyite parties, who are determined to hijack the party,” Gapes says. “Tom Watson tried to discuss it with him, but he refused to see him,” he adds. “We are in an existential struggle for our party. We lost during the referendum a third of the nine million voters who chose us at the last election. A third voted for Brexit,” Gapes says. Lawmakers accuse Corbyn of failing to provide a clear, unambiguous pro-EU message and say his office sabotaged the Remain side in the EU campaign. “He emphasized the problems with the EU and downplayed the positives,” Gapes complains. Anna Eagle, Labour’s soft-spoken former business spokeswoman, is likely on Monday to challenge Corbyn formally for the leadership. Others at that point might throw their hats in the ring. Corbyn could stand, opening the prospect of a prolonged leadership election that will see the fracture between Labour MPs and the younger generations of party members widen, prompting a formal split. The lawmakers say they can’t shy away from the confrontation, fearing an early general election, which many observers here think likely would see Labour wiped out in the heartlands of northern England by the nativist UK Independence Party (UKIP). “I wouldn’t rule out an early election. This is an unprecedented crisis,” says Kevin Maguire, associate editor of the pro-Labour Daily Mirror tabloid. Only 10 of Labour’s 229 MPs supported the Leave campaign, but studies suggest that majorities in 70 percent of districts won by the party in the 2015 general election voted for a break with the European Union. According to political commentator John Harris, the Brexit referendum has brought to a head a historical challenge for Labour as well as center-left parties across Europe. 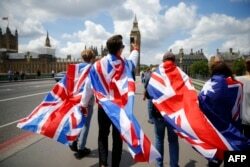 People walk over Westminster Bridge wrapped in Union flags, towards the Queen Elizabeth Tower (Big Ben) and The Houses of Parliament in central London on June 26, 2016. “Labour is a 20th century party adrift in a new reality,” he argues. “Its social foundations – the unions, heavy industry, the nonconformist church, a deference to the big state that has long evaporated – are either in deep retreat or have vanished completely. Its name embodies an attachment to the supposed glories of work that no longer chimes with insecure employment and insurgent automation,” he adds. The split between party members of older generations and the young Corbyn loyalists in parliament and in the constituencies is clear. Corbyn loyalists focus on issues away from the workplace and the traditional Labour politics of hearth and home. They concentrate on gay rights, climate change and gender equality, and their bid to bring about a progressive Rainbow coalition of diverse and very London-based far left and social justice groups. For working-class folk beyond London living in the hollowed-out industrial, steel and mining towns of Britain devastated by globalization the nativist message of the anti-immigrant UKIP resonates. There was some relief Monday for Labour on the UKIP front when Nigel Farage, the man largely responsible for Brexit, announced he's resigning as the nativist party’s leader. Nigel Farage, the leader of the United Kingdom Independence Party (UKIP), speaks at a news conference in central London, July 4, 2016. 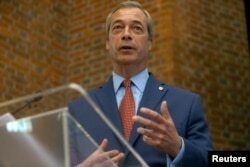 Farage said he will step down as leader of UKIP. This is the second time Farage has resigned as UKIP leader – he did so after the 2015 general election when failing to win a parliamentary seat but came back days later. Some analysts here believe that Farage’s resignation this time may be a political maneuver which would allow him to join the Conservative Party and secure a government position in the event Brexiter Angela Leadsom wins the Tory leadership and replaces David Cameron as Prime Minister. Leadsom is currently trailing Theresa May in a drawn-out Conservative leadership process.